Note: The two tubes forming the first section (from left to right) of the —ceiling“ of the course are 24“ tubes which are different from the 36“ tubes that form the second and third sections. 1. Create the Toobeez obstacle course (as pictured above) using eight 36” tubes, two 24” tubes, eight 16” tubes, 16 spheres, and two curtains. spheres, and two curtains. 2. Connect four 11”tubes with a sphere attached to each one (four spheres) to any part of the obstacle course. 1. Sit across from the child/children on the floor. Wait until you have their attention, and then read aloud the Activity Challenge Box below. Challenge: Move through the obstacle course following this pattern – over, under, under, over. Collect one 11” tube each time you pass through the obstacle course. After all the 11”tubes are collected, construct a square out of the collected tubes and spheres. 2. To wake up all muscles of the body, complete the “Pre-Activity Warm-Up Routine” located on page 16 at the beginning of this workbook. 3. Instruct the child to move to the beginning of the obstacle course. 4. Instruct the child to jump over the curtain, move their body under the next two bars, and then jump over the last curtain. 5. 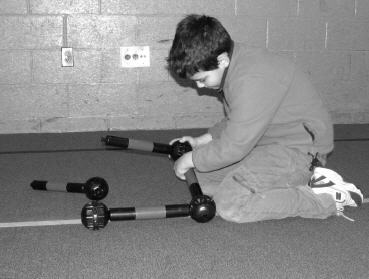 Remind the child that only one 11” tube may be detached and collected each time they move through the obstacle course. 6. Also, remind the child that the only tubes their body can touch are the 11” tubes (they must use their hands to detach them from the obstacle course). All other tubes should not be touched; this will heighten their awareness of their body as they move through the obstacle course. 7. Once they have collected the first 11” tube and have moved through the obstacle course, they are to run around the side of the obstacle course and place the 11” tube in a designated area. For safety purposes, children are not to throw the tubes into the designated area. Remind them to squat down and place the tube on the floor. 8. The child should then repeat the obstacle course from the beginning, collecting a new 11” tube. 9. Once the child collects all of the 11” tubes, they should then create a predetermined shape or structure with the collected tubes (see the picture below). The child should be moving through the obstacle course four times before constructing the square. Therapist Tip: The number of tubes to be collected determines the number of times the child should travel through the obstacle course. This student collected all four 11” tubes and is now creating the final shape. 10. Remind the student that this is not a timed activity, so they should not rush through the obstacle course. 11. When the activity is complete, move on to the Discussion and Processing questions. Did he/she appear clumsy and bump into all of the tubes? Did the child have trouble jumping over the curtains? Could he/she step over instead? Was the student able to remember the auditory instructions given or did he/she need a visual diagram to follow? These assessments are valuable pieces of information to report to classroom teachers, parents and team members when programming for a child/student. Use the questions below as a guide for your discussion. Select the questions you feel will best benefit your child. It is not mandatory to cover every question. Make sure to let everyone (other staff observing, parents that are observing the session) share their ideas, and remind participants that everyone’s opinions and feelings are important! What was easy about this activity? What was frustrating or difficult about this activity? How did you feel after you successfully made it through the obstacle course? How does your body feel after moving around and doing this activity? Do you feel more awake? Was this activity difficult or easy for you? Did you need to change your approach to the task at all? What does the phrase “just right challenge” mean to you? Why is it important to always be aware of a child’s frustration level during activities? How could we work together to utilize this activity and various other movement activities across all areas of the child’s day? Complete the same obstacle course without requiring the collection of the 11” tubes to create a square. If it is difficult for a child to jump over the curtains, ask them to step over instead. Children with gravitational insecurity may have difficulty with jumping over the curtain. Challenge them to try stepping over one curtain. Continue to add pieces to the obstacle course to make it longer, more narrow, or require more changes in body positions throughout the course. You can also add more pieces to the original course to collect for the shape/structure at the end. 4. Integrate the activity with a classroom lesson plan. If a child is school-aged, talk with their teacher and ask what spelling words they are studying, math problems, etc. On index cards, write out the letters of the spelling words (one or two letters on each index card) and tape the index cards to the 11” tubes to be collected. Once all of the tubes are collected, instruct the student to connect the tubes in the sequence to correctly spell their word. For integrating math lessons, break down problems they are studying, write them on index cards, and tape them to the 11” tubes to be collected. Once all of the tubes are collected, they must arrange the tubes in the sequence that will solve the math problem. Line up about six cones in a pattern to follow on their way back to the starting point of the obstacle course and instruct them to complete another movement around the cones. For example, children could weave around the cones while crab walking, bear walking or walking backward. 6. For small group settings. As many students that are in the small group (no more than four are recommended), add the same amount of extra construction pieces to the original obstacle course structure. Each child should go through the obstacle course and add their collected piece to the shape to be completed after moving through the obstacle course. Candice Donnelly-Knox is a licensed and registered occupational therapist with over three years of experience. She has experience working with students (ages 3 to 21) with a variety of needs including Autism Spectrum Disorders, ADHD, Cerebral Palsy and Down syndrome etc. Candice is dedicated to providing each student with an individualized plan to address their unique educational needs; needs that may include activities of daily living, coping skills, reading and handwriting, and functional math skills such as money management, pre-vocational and vocational skills.